Made by Hunter knight customs! HKC is proud to present you with another original Black series character: Captain Tarkin! 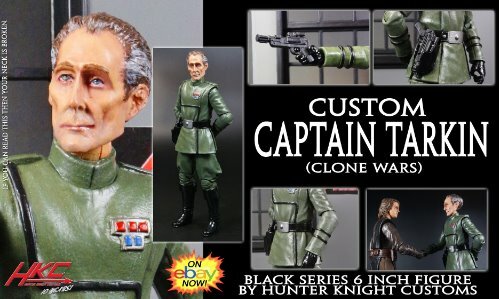 -One fully detailed and articulable 6 inch tall Captain Wilhuff Tarkin figure, based in the episode "The Citadel" from the third season of the Clone Wars animated series. -Classic clone wars Captain uniform complete with rank cylinders, chest and sleeve ornaments. -Realistic paint applications on face, for a life like appearance. -Inspired by the Star Wars Clone wars show , translated into a realistic style to fit your Black Series collection. This is a custom figure, a fan made rendition with no affiliation to Hasbro, Lucasfilm or Disney enterprises.